Sustainable Tourism on a Finite Planet will give you a comprehensive and deep understanding of all of the multiple actors in the international tourism industry and their environmental impacts and challenges, along with economic, political, and cultural dimensions.The comprehensive analyses of each segment of the industry – tour operators, cruise liners, airlines, hotels, and the emerging online tourism entrants – lay out quantitatively and qualitatively the business models, competitive dynamics, policy, and environmental aspects.The analyses are evidence-based, drawing on a wide range of research and studies.The author’s decades of experience in multiple sectors of the industry, including nonprofit, for profit, and governmental organizations, illuminate the book with practical case examples, insightful first-hand experiences, and valuable expert judgments.The presentation is very well organized and exceptionally clearly written. The book is illuminating reading and enriching learning. 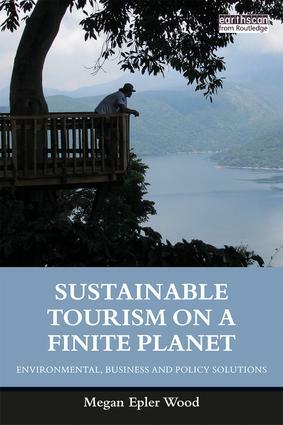 Sustainable Tourism on a Finite Planet is both comprehensive and provocative. A must-read for anyone interested in the present and future state of travel and tourism in the face of global climate change, poverty, and ecosystem degradation. Grounded in decades of leadership and experience, Epler Wood methodically presents the comprehensive social, environmental, and financial impacts of what has become one of the most important economic engines of the global economy and introduces new business models and approaches to move us beyond overconsumption of limited tourism assets. Epler Wood’s book carefully documents why travel and tourism plays a critical role in preserving natural and social capital and its seminal importance to human health, well-being, and compassion in this multicultural world. With equal emphasis, it outlines the importance of replicable measurements of the industry’s cumulative impacts, with in-depth analysis of each of the sector’s major industrial sectors – hotels, tour operators, cruise lines, airlines, and airports. Read this book to learn how to approach this global industry. How will we protect destinations with projected global population growth and an increase in the demand for travel? Epler Wood lays out an integrated vision for sustainable tourism that effectively addresses the relationship between traveler consumption patterns and their impact on natural resources. For corporate social responsibility and tourism destination managers alike, this book offers indispensable real-world case studies and provides a vision for a pragmatic way forward. Megan Epler Wood founded and led The International Ecotourism Society (TIES) from 1990 to 2002. She is the Director of the International Sustainable Tourism Initiative at the Center for Health and the Global Environment, Harvard T.H. Chan School of Public Health, an instructor of online courses in sustainable tourism at Harvard Extension’s Graduate School of Sustainability, and a Senior Project Associate at the Center for Sustainable Global Enterprise, Samuel Curtis Johnson Graduate School of Management at Cornell University. Her consulting practice EplerWood International fosters sustainable tourism development in Africa, Asia, and Latin America.